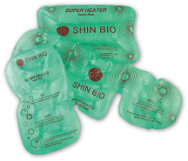 The Shin Bio Heat Pack is a Heat Pack that contains water, sodium acetate and an aluminium disc. Clicking the aluminium disc forces a few liquid molecules to flip to a solid state. This triggers a chain reaction, causing the sodium acetate solution to supercool and crystallize – thereby producing heat. Depending on the size of the Heat Pack, it will generate heat for at least 30 minutes and up to two hours. For longer lasting heat, massage the Heat Pack as this disperses the heat, keeping it soft and malleable. Heat Packs are portable and can give you instantaneous heat in any situation at the flex of a button. Alternatively, use as a cold pack by placing in the refrigerator for 1 hour. Never freeze the Heat Pack. When the Heat Pack becomes hard, reuse it by placing it in a pot of boiling water. We recommend you first place a plate or thick cloth on the bottom of the pot to protect it. Boil the Heat Pack until it appears clear of crystals. This should take 5 - 15 minutes. Using tongs, remove the Heat Pack from the water.